Happy Friday, y’all! It’s that time again…Finish It Friday! Today: the garage. 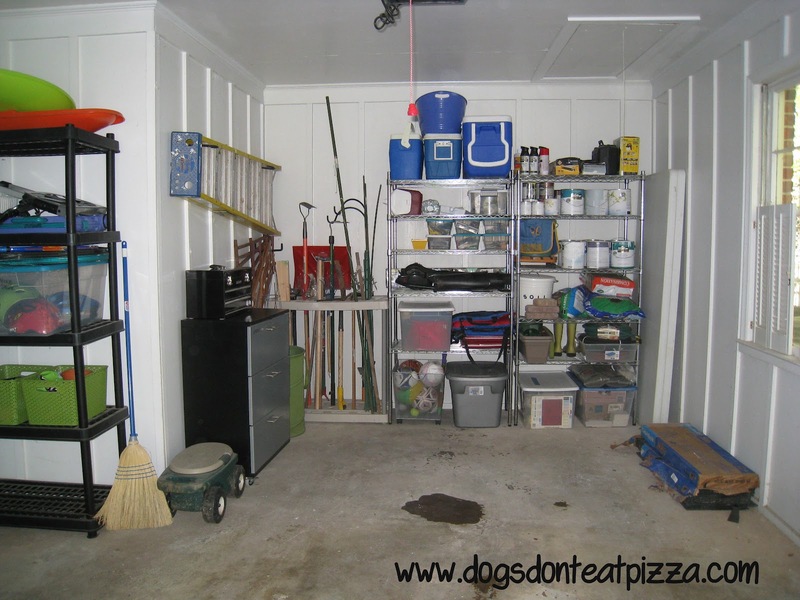 At the beginning of the summer, I cleaned out and organized our garage, as you can see in this POST. It was a wonderful thing. 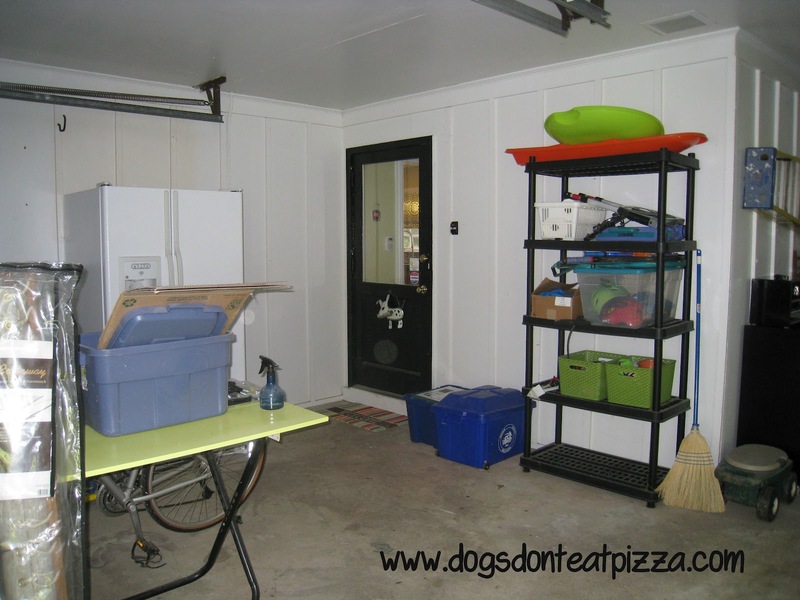 As you can see from the pictures on that post, though, we still had a storage room door at the back of the garage (although I had emptied the storage room in anticipation of our big pantry build – wahoo!). Then the kitchen renovation happened. Our garage turned into a construction zone first (when the pantry was being built), and then a storage room for all the kitchen stuff while the rest of the renovation got done. It was a mess. I didn’t take a picture of it as a mess, because, well, it was a mess. It was embarrassing. You just gotta trust me that it was a disaster area. I haven’t been able to park my car in the garage since June. Sigh. I organized by zones (I like organizational zones). On the far right shelves, the top shelf has tools (out of the reach of little hands). Then I have two shelves with paint and paint-related stuff (like primer and polyurethane). Then I have garden stuff, like soil, tools, boots, etc. Then I have heavy stuff on the bottom, including painting supplies and extra tile. On the middle shelves, I have coolers on the top shelf, since we don’t use them all that much and they’re big. Then I have plastic shoe boxes, labeled, with various stuff, including picture hanging hardware, switchplates, garden stakes, and random extra parts. Then I have our “picnic stuff,” which is a container with a blanket; smaller, soft-sided coolers; and seat cushions. Then the bottom shelf has a basket of the kids’ balls and a container for beach toys. On the left side are tools, both hardware and gardening. I also hung the ladder on the wall using heavy duty hooks. This picture (above) is of the left side of the garage, and you’ll see the table I bought at the Decatur First Baptist garage sale. 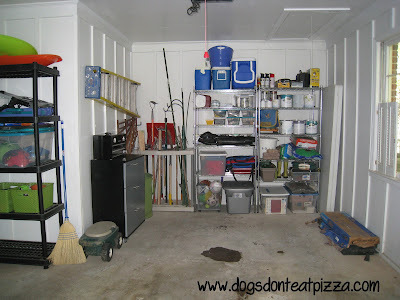 My plan is to turn that side of the garage into my work space, where I can do projects and gardening as well. The shelves next to the door hold the kids’ toys and bike-related stuff, like helmets, air pump, and locks. So, that’s my finished Finish It Friday project for this week.